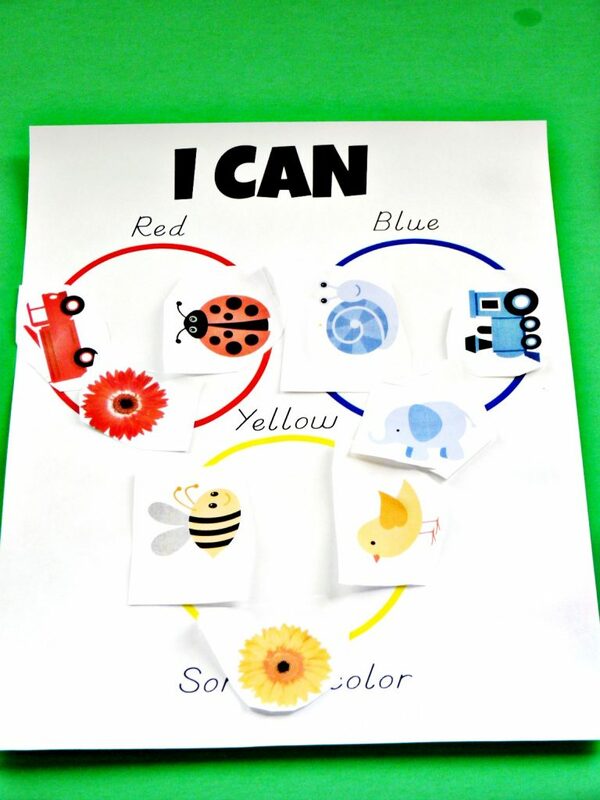 I am so excited to share with you this fun ” I can” booklet for preschoolers. 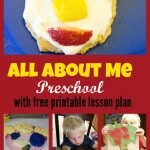 My son loved putting this book together and I know your preschooler will too. 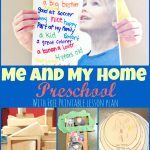 Every time I pulled out a new page he would excitedly say ,” I can do that!” This would be a great addition to an all about me week or just a fun project to do with your child anytime. The first page of the pack is the cover page. It has a blank frame available to fill with a picture of your choosing. I asked my son to draw a self-portrait here. If you wanted to you could instead take and print a picture of your child to glue here or let them decorate the cover however they please. The next two pages are I can color and I can draw. For the coloring page ask your child to do their best job coloring the pig. For the drawing page, I let my son choose to draw any picture he wanted. You could ask your children to draw something specific if you want but I really wanted this book to be something he felt he created on his own so I left that decision to him. The I can paint page is another chance for your child to show off their creative skills by painting a picture of their choice. I had my child use watercolor paints for this. Whatever kind of paint you choose to use just make sure it has time to dry before assembling your book. Next, your child can show how they recognize the difference between sizes by sorting the spiders into two groups. I let my preschooler cut out the spiders and glue them on as well. 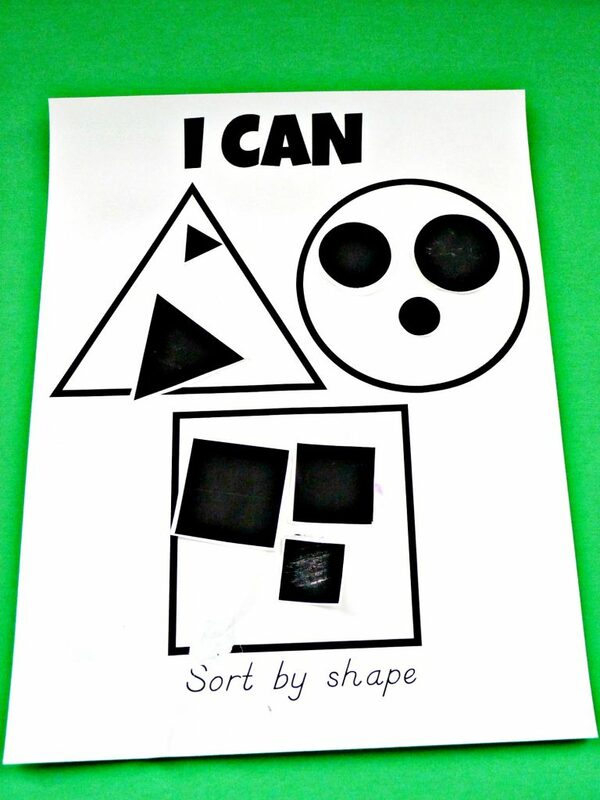 I can sort by shape page test your child’s knowledge of shapes. Let them cut, sort and glue each shape to the correct place. I can sort by color is the last of the sorting pages included in the I can book. It gives your preschooler a chance to match the different color pictures to the correct colored circle. 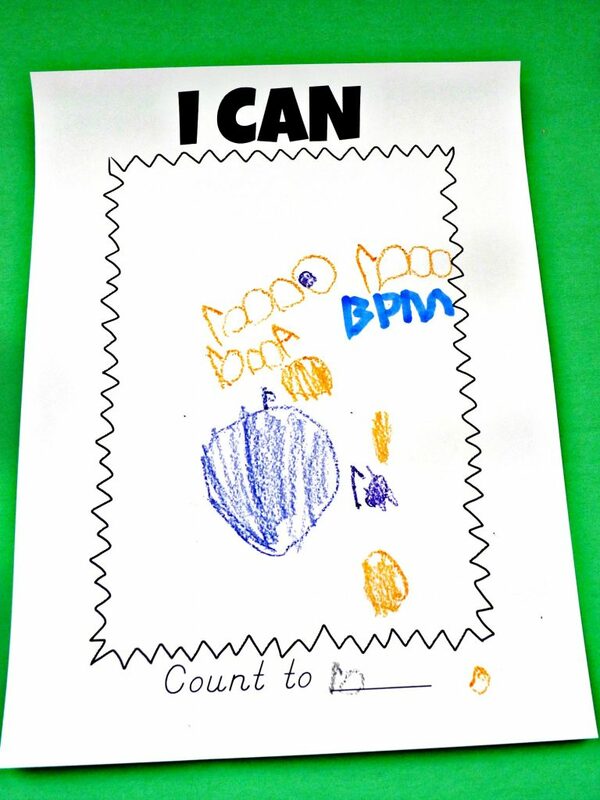 The I can count page lets your child demonstrate how high they can count. I had my son count as high as he could. Then I had him write that number in the blank. I asked him to illustrate the number by then drawing that many objects to count in the box. This page ended up a little random but he was still proud of his ten pictures. I think if I was going to do it again I would maybe ask for ten or the same objects or perhaps tally marks. The last few pages are blank so that you can customize them any way you want. This is a great place to add in pictures of things that your child is really proud of being able to do themselves. Preschoolers learn how to do so many new things each day. This book is really a fun way for them to showcase their newly learned skills. 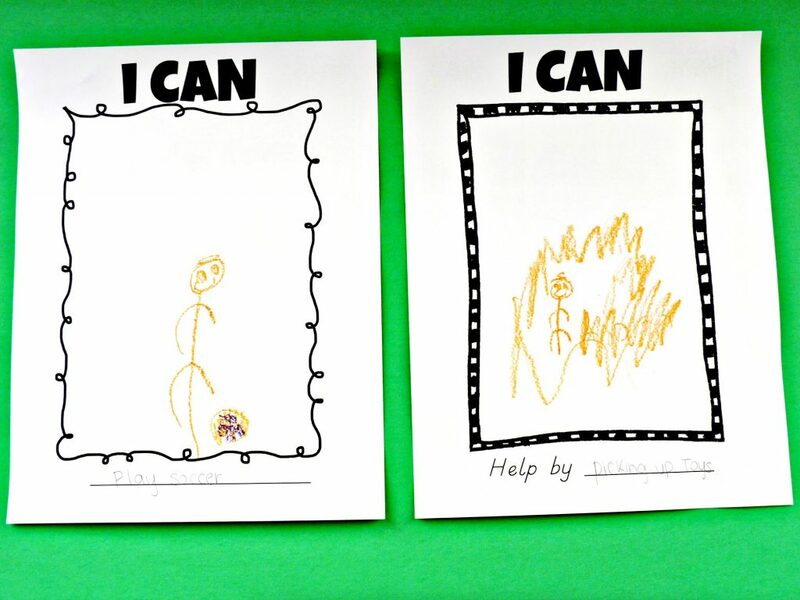 I hope that you and your kids have a great time putting together this” I Can” book and that it can be a keepsake that your children can be proud of. 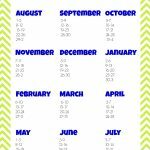 If you would like a free copy of this printable I Can book sent to you simply sign up for our email list. You can find the sign-up form on the left sidebar. I subscribed, but could not print the “I can” book. Sorry about that Amy. I sent you an email. Let me know if you still have trouble with it. I don’t see a link to download the “I Can” book and I just subscribed. Sorry Robin,It should arrive with your welcome letter. I sent you an email. Let me know if you have anymore trouble downloading it. I sent you an email Angie. I cant seem to find the link to download can anyone help?? Sorry about that Jenny! The download comes in the welcome email. Sometimes it can get filtered into the spam folder so you might want to check there. I’m going to email you to make sure you get it okay. I subscribed two days ago and still haven’t recieved anything. Could you please email me. Thanks! Looking forward to spending the school year with you! Sure! Sorry about that Danielle I’m sending you an email right now. I signed up for e-mail. Cute ideas. 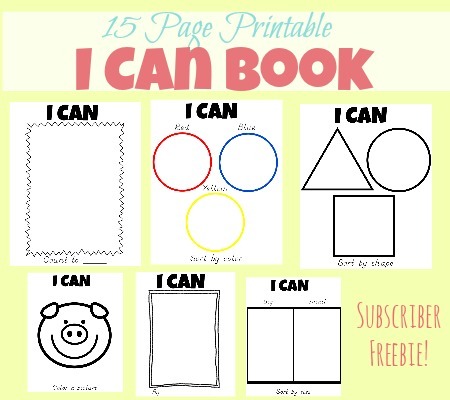 Can I get this “I Can” book sent to my e-mail? Thank you! I, too, would love to download the I Can Book but am not able. Please help…..this is such a cute idea! Thanks! I’m so excited to do this with my daughter! I think she will love it! I hope she does! Enjoy!